California Nurses Assoc. members fought for and won the nation’s strongest workplace violence protections. 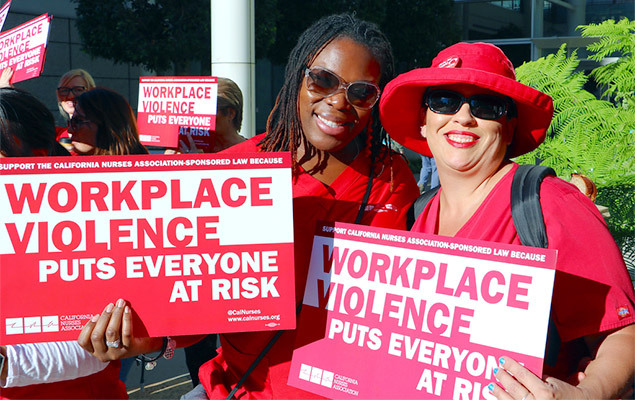 Thanks to a hard-won fight by the California Nurses Association, as of April 1, California healthcare employers without a plan to prevent workplace violence will be breaking the law. And with California’s landmark healthcare workplace regulations serving as a national model, nurses will not rest until all workplaces, in all states, are safe. Long before I was the Executive Director of the largest registered nurses’ union in America, I was an ICU nurse, shielding myself from a confused patient swinging an IV pole around his head with deadly force. The experience was terrifying — but not uncommon, given that healthcare workers face outrageously high rates of workplace violence. In fact, 58 hospital workers died as a result of violence in their workplace between 2011 and 2016, according to the Bureau of Labor Statistics. The BLS also found that RNs in the private sector experienced violence-related injuries at rates three times higher than any other industry in 2016. Violence in hospitals runs the gamut from being verbally threatened by a patient, family member or visitor — to being seriously wounded or even killed on the job. In the past year alone, a disgruntled employee shot and killed a nurse supervisor and injured another worker at an Alabama hospital, an individual killed a doctor on the way to his car in the parking lot of Ohio’s Affinity Hospital, and a gunman at Bronx Lebanon Hospital shot six staff members and one patient, killing a doctor. CA Occupational Safety and Health Standards Board Thanks CNA. The Cal/OSHA Health Standards Board thanks CNA nurse members for their significant presence and testimony, which helped shape the California healthcare workplace violence regulations. Nurse power! The threat of workplace violence hangs there daily for healthcare workers, leaving us constantly wondering whether we are safe — and by extension, whether our patients, their families and visitors are safe. And that’s why nurses in California rose up collectively to do something about it. The California Nurses Association/National Nurses United (CNA/NNU) sponsored, fought for and won S.B. 1299 (passed in 2014), a law stating that California healthcare employers must be responsible for protecting workers from violence before it happens. How? By having a healthcare workplace violence prevention plan, as overseen by Cal/OSHA. And now, after a years-long process in which the regulations governing California healthcare employers were developed and enacted (CNA members can be so proud of the significant testimony they provided during that process) — the time has finally come. As of April 1, 2018, healthcare employers in California must have their workplace violence prevention plan in place. If they do not, they are breaking the law. FOR MORE INFO ON THE CA REGULATIONS AND THE APRIL 1 DEADLINE, CLICK HERE. What makes the California regulations so important is that they focus on prevention — to stop violence before it happens. California healthcare employers are now required to identify specific risk factors for each unit, throughout a facility, and establish procedures to correct any workplace violence hazards, including providing adequate staffing to protect nurses, other health workers, patients, families and visitors. The regulations also require employee training that emphasizes how to recognize potential violence and counteract risk factors. And because healthcare workers know best what risks are particular to their unit, employees must, by law, be involved in development and implementation of violence prevention plans. Allysha Shin, RN, describes being attacked by a patient. Violence in healthcare settings is a national issue. That’s why nurses are so proud that our landmark California protections have become a model for federal legislation — the Health Care Workplace Violence Prevention Act, HR 5223 — introduced in March by Rep. Ro Khanna (CA-17). With the support of 14 other members of Congress, the bill proposes at the national level the same protections that nurses won in California. And what works for healthcare facilities should be extended to all workplaces. To that end, in California RNs are working with Cal/OSHA to develop additional regulations to expand workplace prevention rules across other settings. We know that in the era of the Yountville veterans home shooting and mass school shootings, there is growing national concern over public safety in all workplaces, including schools. Rest assured that the nurses will be there, standing in strong solidarity with students, teachers, and workers from all industries, in a people’s movement to demand greater public health and safety. Nurses never give up on our patients, and we will never give up on fighting to ensure that everyone is safe from violence.